All media, the so-called fourth authority of power, has been facing some international challenges, with the European Parliament set to vote next Monday on final text of Article 13, the proposed EU directive on copyright, which, if implemented, could censor internet users and internet platform hosts through artificial intelligence-employing filters. Just a few weeks into the new year, the ruling Peasants and Greens (LFGU)are muddling through controversial amendments to the law on Lithuania’s public broadcaster, LRT, which envision establishing of a new governance body, a board. Such a board would be in charge of the LRT’s management, structure planning, economic activity and would approve deals over 29 000 euros in value. If implemented, shorter terms of LRT Council members will be set and changes in its formation procedure will take place. The new version of the law was logged in by the LFGU leader, Ramūnas Karbauskis, and members of a special commission which was tasked with scrutinizing the LRT’s activity. The bill matches the commission’s conclusions which were voted down by the parliament in late December. Despite the setback, the parliamentary majority instead of shelving the bill or going back to the drawing table and redrafting it, a standard procedure after a legislative failure on the parliamentary floor, snubbed the commission’s findings and moved illegitimately forward with the enactment of the amendments. Notably, the ruling MPs did so without a ruling on the issue from the Constitutional Court to which the Lithuanian Parliament opposition, Conservative Homeland Union- Lithuanian Christian Democrats (HU-LCD) applied. «The fact that the ruling party is escalating the adoption of the draft law prior to the ruling of the Constitutional Court on the legitimacy of the ad hoc commission is a sound proof of hastiness to exert political influence on the Public Broadcaster,» Monika Garbačiauskaitė- Budrienė, LRT director general, told said. «Over the last year, LRT has been experiencing significant pressure from the ruling party which aims to make substantial changes in the law on Public Broadcaster,» she emphasised. The LRT Council was asking lawmakers throughout not to hasten with the adoption of the new law version and to listen first not only to the Constitutional Court but to domestic and international media law experts as well. The LRT management fears that the changes pose threat to the public broadcaster’s independence. However, the defiant political majority on January 11 moved forward with the amendments with 50 MPs voting for them, 36 – against and 2 abstained, which was enough to clear the first legislative obstacle. «Now the draft will be submitted to parliamentary committees and the Government for further deliberations. The Seimas plans to revisit the draft bill in its spring session,» Rimas Rudaitis, chief specialist of the Information and Communication Department in Lithuanian Parliament, said. 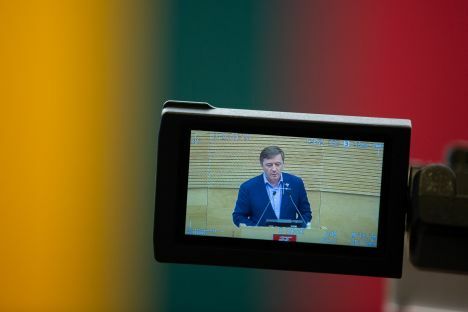 The opposition HU-LCD have registered their own version of the LRT law before the parliamentary sitting, one drafted on the British national broadcaster BBC’s model, but the bill to their dismay was not included into the Seimas (Lithuanian Parliament) agenda. «What we see is the remnants of Sovietism and the reflection of the new trends budding in Eastern Europe. We have the examples (of constraints of media freedom) in Hungary, Poland and, lately, in Romania. Now Lithuania starts playing the loudest chord in the choir,» Eugenijus Gentvilas, also a liberal MP, said. Specifically, the RTCL would be entitled to halt a TV program for up to 72 hours without a court ruling to prevent them from what it deems is dissemination of ostensibly harmful information. RTCL chairman Mantas Martišius says that the amendments are meant for swift response to national security threats and its formulations were taken from the strategy approved by the parliament. «This is an instrument giving us the possibility to protect ourselves, the possibility to respond to threats arising during elections from the people and media outlets influenced by countries hostile towards us,» Karbauskis, the leader of the ruling party,has echoed. He however argued that the committee under his leadership did not add a single word to the amendment bill, adding that the amendments are related to the implementation of the EU directive. Martišius, of the RTCL, also pinpointed to the EU directive stipulating that member states can impose sanctions on media outlets posing threat to public security, including ensuring national security and defence. However, media experts lambastthe proposals, claiming that they infringe media freedom and the constitutional right offreedom of speech in the Baltic country. Having noted that the whole amendment bill is related to the updated EU Audiovisual Media Services Directive, Deimantas Jastramskis, a lecturer at Vilnius University’s Institute of Journalism, voiced his concerns: «They include such things like «distrust in the state and its institutions» and «promoting ethnic and cultural divides». Who’s going to identify that? These are subjective things, interpretations that should not be included into legislation. This is legal intrusion into people’s opinions and way of thinking, and it’s unacceptable in a democratic state… It’s a sad but not a new thing that it’s being done under the cover of the EU directive,» Jastramskis said. Aistė Žilinskienė, head of the Online Media Association, believes that the proposed expansion of prohibited information would protect state institutions from any criticism. Although Lithuanian media is ringing alarm bells, Dainius Radzevičius tends to calm down everybody, insisting that «common sense» and «democracy» will prevail at the end of the day. «Both the LRT law changes and the implementation of the updated EU Audiovisual Media Services Directive are still in the tentative stage and will likely be reworded significantly as they, if enacted, would run counter our own Constitution and the EU norms,» he told BNN.«I am sure all understand it,» he underlined.